June | 2013 | Reclaim America From The Lunatic Fringe! 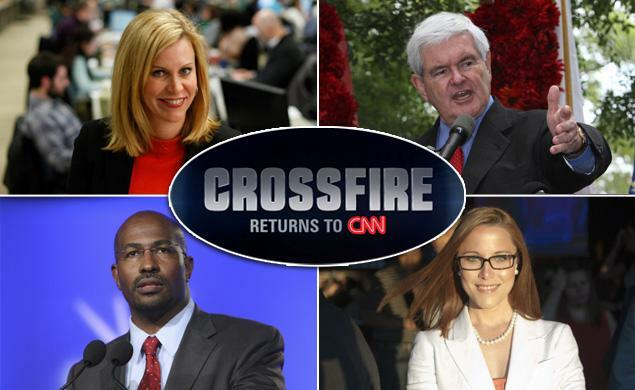 Just like We watch NASCAR for the wrecks and Hockey for the fights, so too will America have a strange fascination with CNN’s revival of the old “Crossfire” political debate show, but this time, I think they struck TV gold! The show has 4 co-hosts, 2 of which are Van Jones and Newt Gingrich. Names and political ideologies which immediately caught my attention as soon as I saw they were involved with the show. Crossfire,” the long-running political debate show that aired on CNN from 1982-2005, is getting a reboot, the news network announced Wednesday. Four new hosts – two on the left, and two on the right – will debut the program this fall. Former House Speaker Newt Gingrich, who made a bid for the 2012 GOP presidential nomination, will host on the right alongside S.E. Cupp, the conservative columnist who currently co-anchors “The Cycle,” a television program on MSNBC. On the left, President Barack Obama’s former deputy campaign manager Stephanie Cutter will host next to Van Jones, another former Obama adviser who later founded Rebuild the Dream, a group that fosters innovative economic policy.